Antwerpen. 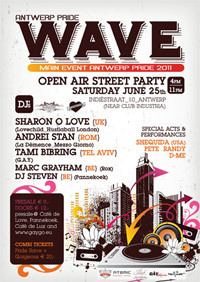 The Antwerp Pride 2011 Main Event will be an event like youâ€™ve never seen before! The organisers and promoters behind CafÃ© de Love and CafÃ© de Luxe on the one hand and Pannekoek and Mezzo Giorno on the other hand will be joining forces to organise a special event. Last year they worked together at the request of Antwerp Pride for the successful Antwerp Pride Closing Festival and now they will make sure Antwerp will shake on its foundations on Saturday. This doubble party event on saterday is for all national and international visitors for lesbian, gay and openminded people . It start at 4PM-11 PM. The open-air afternoon event WAVE has many DJs programmed. In the evening you can go to GORGEOUS! In one of the most exclusive party venues (Club Industria) of the city 4 DJs will be performing on stage that night. Also a special act of Sherry Vine. The open-air afternoon event takes place nearby the street of the club where the evening event is organised. Like other parties before , this party is not exclusive Gay . All openminded people are welcome. Tickets on gaygo.nl en www.gorgeous-party.com.